Article: An evaluation of chatbots as software aids to learning English as a Second Language. David Coniam. Article: The SHAIEX Project: Principles and Practice for Multimedia Foreign Language Learning in Pre-school. Patricia Edwards, Mercedes Rico, Alejandro Curado, Juan Enrique Agudo, María Antonia Pain & Héctor Sánchez. Recommended website: BECULT. Martina Rost-Roth, Mats Landgren & Mikko Turunen. Report on EUROCALL SIG: Natural Language Processing SIG. Cornelia Tschichold. Report on event: New Horizons in Linguistics: e-Research for Multidisciplinary Collaboration in the Virtual Environment. C.K. Jung & Y.O. Jong. The forthcoming issue of ReCALL (Vol. 20, Part 2) will be distributed to EUROCALL members in May/June 2008. Please send articles, software reviews, details of relevant events or other items of interest for future issues to June Thompson, Editor ReCALL d.j.thompson @ hull.ac.uk. 'Chatbot' programs are pieces of software that can hold a conversation, or interact, in English. This paper explores the potential of chatbots for ESL (English as a Second Language) learning from a pedagogical perspective. From the command-line days of Eliza, chatbots have matured considerably � to the point where many chatbots now involve an avatar interface, with speech recognition also becoming available as a feature. The paper evaluates six chatbots currently available either online or for purchase. The evaluation examines chatbots from the perspective of their interfaces as a human-looking or sounding partner to chat with, as well as their usability as pieces of software suitable for ESL learners. To put some of these issues in perspective and provide insights into their use, the paper also reports on the use of some chatbots in the ESL classroom. The paper concludes with an analysis of chatbots currently available, noting that while chatbots have matured considerably since the early days of Eliza, they still have a long way to go before they can interact with students in the way that researchers such as Atwell (1999) envisage. This paper is the second of two which examine chatbot programs � computer programs which attempt to maintain a conversation with a human. The previous paper reviewed five chatbots (the first five in Table 1 below), exploring how they handled and produced language from an essentially Hallidayan systemic functional grammatical perspective of performance at the level of word, clause and text [Note 1]. Essentially, chatbots perform best when the language input consists of one-clause sentences, the proposition is straightforward, and the topic is an everyday one (A summary is presented in Table 2 below before the details of the current study are presented). The previous paper also provided considerable background to chatbots in terms of their history and development. This will not be restated here. The reader is referred to Coniam (forthcoming) for background historical information. The current paper moves forward from a linguistic focus to examine chatbots from the perspective of their features, functionality and usability in pedagogical terms. If we are to view chatbots as CALL software, a useful starting point is Salaberry's (1996) discussion of what constitutes a �minimal theoretical framework� with regard to effective CALL applications. Salaberry posits that CALL's effectiveness as a medium in language learning depends on three elements: the role that the message plays in the medium within the language-learning situation; the content of the materials; and the ways medium and content interact within the whole language-learning experience. It is also worthwhile considering Warschauer and Healey's (1998) delineation of the four �stages' of CALL since this helps to further situate chatbots within the larger CALL framework. In their overview of the development of CALL, Warschauer and Healey (1998) describe four CALL �stages' comprising: �Behaviouristic' CALL, 1960s and 70s; �Communicative' CALL, 1970s and 80s; �Integrative' CALL, mid 1990s onwards; and �Intelligent' CALL, 2000s onwards. The rationale for the �Intelligent' CALL stage (Warschauer and Healey 1998: 65-66) � where the current paper positions itself � is that the intelligent power of the computer should maximise interaction with the material to be learned, with �intelligent' programs providing meaningful feedback and guidance to students, and with comprehensible information presented through multiple mediums to fit the learning style of individual students. A useful extension to Warschauer and Healey's Intelligent' CALL stage is found in Atwell's (1999) survey of Speech and Language Technology applications. Atwell investigates different types of language engineering software from the perspective of a �language machine'. He also investigates how this will impact on ESL teaching over the next two decades with regard to applications such as sentence and text-level analysis and understanding; voice recognition and text-to-speech conversion; and human-machine interaction (1999: 8). The value of chatbots for language learning is clearly apparent: they have the potential to provide a convenient chatting environment for learners to conduct authentic conversations in the target language either by writing or by speaking. Further, the chat transcripts (as in Figure 2, for example) provided by some programs can serve as a source of the target language. Various researchers have commented on the potential of chatbot as a conversation simulator conducting conversations with users on various topics. Parker (2005: 49), for example, discusses the use of chatbots with young English language learners. She states that while chatbots' ability to converse is still limited, they have potential for second language learning support � although little use appears to have been made of chatbots for this purpose thus far (2005: 49). Although chatbots have not been totally ignored in the language teaching literature, there is very little literature on their use and potential. In their innovative book on conducting CALL activities with (at the time) generally-available software, Hardisty and Windeatt (1989: 75), for instance, suggest an activity simulating a job interview with an Eliza -type program. The Monthly ESL Newsletter of the ESL ALL! International website contained a feature in its November 2005 newsletter on conversing with a �robot' as a way for learners to improve their writing or listening skills (http://www.eslall.com/newsletter/Newsletter_nov_05.html). There is no evaluation of the bots listed, however. The newsletter simply describes the features of 10 online bot sites. In a study with undergraduate ESL teachers in training, Coniam (2004) describes an evaluation of the ALICE Artificial Intelligence Foundation site's Dave (also evaluated in the current study). It is claimed that Dave is the �perfect private tutor�, since he replies �in perfect English just like a private English teacher� (http://www.alicebot.org/dave.html). Teachers' attempts at conversing with Dave indicated that, conversationally, Dave showed considerable development from the restricted pattern matching employed by Eliza . However, while many of Dave's conversational strategies had quite a natural feel, there were syntactic infelicities and conversational glitches which indicated that the program is unlikely to pass the Turing Test in the near future (Coniam, 2004: 160). The developers of the Lucy chatbot (http://www.speak2me.net) �quite rightly recognising the potential of a speaking partner� have recently adapted elements of the online Lucy chatbot into a standalone piece of software, Lucy's World: Smallt@lk (Ladder Digital Education Corp., 2005). This utilises the speech and interactive elements of the Lucy chatbot, but attempts to control the situation by restricting the topics and situations that Lucy is able to converse about. In areas other than ESL, Chatterjee and Meijer (2005) describe the DeMeCoT Chatbot, a conversation trainer, for learners of Dutch. As a supplement to classroom speaking activities, this chatbot provides students with the opportunity to conduct dialogues �to which they receive response and feedback. However, Chatterjee and Meijer observe that trials and assessments of a range of chatbots demonstrated the limitations of such chatbots as language training instruments. They note that interaction is liable to break down, in part because chatbots lack the necessary knowledge for topic-based conversations; as well as being incapable of eliciting specific language use; and with changes in register usually being somewhat inconsistent. DeMeCoT, as a teaching vehicle, is therefore deliberately limited in its function �which is to enable students to practice certain linguistic structures and forms in simulated and limited conversations. In this paper, six of the most usable chatbots from the perspective of potential ESL pieces of software are reviewed. These were selected on the basis of being strong either in terms of their ability to interact from a language perspective, or having an attractive interface �preferably both. In terms of the interface, it should be noted that chatbots have become considerably more sophisticated since the early days of Eliza , which operated from the command line with text output only. Technology has now matured to the point where, while many chatbots still operate via text input and a text-line response, many also respond in both text and synthesised, quasi-human, speech. Chatbots which will accept voice recognition input from a user are also beginning to appear. Of the chatbots analysed in this paper, a number are drawn from two of the stables which are producing a number of today's commonly-used chatbots �the ALICE Artificial Intelligence Foundation (http://www.alicebot.org) and Pandorabots , a robot-hosting service related to the ALICE community (http://www.pandorabots.com). After examining many chatbots �some online, some needing to be downloaded and installed; some with visual interfaces; and some to be run from the command line� six programs were settled upon. Five of these are available over the Internet; the sixth (the Ultra Hal Assistant ) needs to be installed on a standalone computer. It is included in the current study since it innovatively incorporates voice recognition into the chatbot. TAble 1 lists the six chatbots, and presents the criteria for inclusion. Table 1. Chatbots evaluated in the study. Table 2 below (reproduced from the previous paper) presents a summary of the language issues analysed in the first five chatbots (the Ultra Hal Assistant was not included in the previous study because its speech recognition is dependent upon third party software such as Dragon NaturallySpeaking (Nuance, 2006) or Microsoft's Speech Application Programming Interface Speech SDK 5.1 (http://www.microsoft.com) being installed �see below), with the different criteria rated on a five-point scale (five stars indicating good). Some ratings are supplemented by a comment. Quite broad general topics � family etc. Table 2. Summary of the programs' language capabilities. The review in the previous paper concluded �as can be seen from Table 2� that chatbots had quite wide vocabularies, at least in terms of everyday topics. When input to them was in the form of correctly-phrased sentences, they coped reasonably well. Chatbots generally required correctly-spelt words in grammatically-correct sentences to function well. Some chatbots were able to deal with misspellings, but this was often unpredictable. The majority were really only able to handle input in the form of one proposition at a time, and preferably as a single-clause sentence. The range of topics they were able to respond to varied, although in general they performed much better with common topics. In summary, then, the previous paper concluded that chatbots coped best when the language input to them consisted of one-clause sentences, with a straightforward proposition, and an �everyday' topic. With regard to the different linguistic abilities of the different chatbots, the previous paper concluded that George was by far the most able, although he could be slightly combatative both in his challenges and his efforts to topic switch when unable to provide a direct answer. Lucy and Dave coped acceptably at the single-sentence level, even though their replies were at times far from accurate. Lucy's value, however, increased because she was sometimes able to suggest how to re phrase an incorrectly-framed sentence �an issue that will be revisited in the current paper. Jenny and Cybelle were the most limited in terms of their dealing with language. Ease of use of the program �instructions, help etc. Is it possible to save conversations? Can the chatbot be taught? Does the chatbot remember a user from previous visits? How much of the conversation is presented? As detailed in the previous paper, evaluators were trainee ESL teachers (all of whom rated at IELTS level 7 or above [Note 2]) in the final year of a four-year B.Ed. programme. They were reviewing and exploring the potential of chatbots as part of a 39-hour (three-unit) CALL course on which they were enrolled in their ESL teacher education programme. Each chatbot was evaluated by at least one evaluator, who, on average, spent between 8 and 10 hours working at their particular chatbot. Subsequent to the analysis, some of the evaluators taught ESL lessons where they encouraged students to work with the chatbots they had been evaluating. All analysis was conducted using computers generally less than one year old running Windows XP and via broadband Internet connections. This section now examines the different programs with regard to their appearance and operation as pieces of software, and how they handled language input from users. As mentioned above, many chatbots have advanced from a purely textual interface to an interface which incorporates an audio and/or visual interface, incorporating an avatar �a virtual, animated personality (see Lucy , Jenny below). Such developments not only make for a more user-friendly experience, they also increase the programs' potential in terms of language learning. Figure 1 below provides screen captures of the six programs. As can be seen, the Lucy and Dave screens are devoted solely to the purpose of chatting, as is the Ultra Hal Assistant . These three are visually more appealing than the other three in that the screen is not cluttered with extraneous objects. Although George has various options �including emotion-setting and a help function� the screen is cluttered by many buttons, links and adverts. The Cybelle website is also very cluttered with numerous adverts and other links, all of which distract from its appearance. While Jenny is also somewhat cluttered in that there are links to various other websites, the screen is somewhat clearer than that of Cybelle. The large button to Jenny's right is a link to the Merriam-Webster online dictionary �a useful function for an ESL learner. Figure 1. Chatbots' screen design and layout. As can be seen from Figure 1, Lucy, Dave, Jenny and the Ultra Hal Assistant have more attractive interfaces. These incorporate avatars which smile, move their heads to follow cursor movement, and move their lips in synch with the spoken output produced. Lucy's smiling head and shoulders take up the left third of the screen, with the right-hand side taken up by input and output windows. Dave's trendy-looking head and shoulders occupy the top quarter of the screen with the bottom half containing the ensuing conversation. Jenny is somewhat smaller but positioned clearly in the middle of the screen. Cybelle , although an interesting-looking three-dimensional avatar, was squashed into a small column to the left-hand side of the screen. Unless users know what they are looking for, Cybelle could easily be overlooked. George does not have an avatar, although a three-dimensional version is in preparation. The Ultra Hal Assistant default avatar is an unattractive lizard or robot. This can be customised, however, and the more acceptable human-looking Erica invoked instead (Figure 1 above). The default for George is the text line. It is possible to link up Shockwave, but the speech quality thus generated is mechanical-sounding, and does not sound very human-like. Jenny's speech quality is also artificial. Cybelle has no spoken output at all. The output produced by the Ultra Hal Assistant is somewhat staccato in its delivery. The best speech quality comes from Dave and Lucy, who invoke quite natural-sounding spoken English generators, incorporating acceptable stress, rhythm and intonation. With Lucy, Dave, Jenny and the Ultra Hal Assistant, the avatar's lips also move in synch with the spoken output, although Dave's at times appear to be slightly out of synch. Nonetheless, this is a feature which augments the chatbots' realistic image. Lucy has a large window for the user's input and output � both in a large easily-readable font. Although only the most recent turn is visible onscreen, the �Transcript' button allows users to see the conversation thus far, via a scroll bar. The ability to view � and save � the conversation in this way make for a useful pedagogical feature. Figure 2 presents a sample. Figure 2. Transcript from Lucy. The bottom half of the screen below Dave's face shows the last eight lines of the conversation. Beyond these eight lines, however, nothing earlier can be viewed, nor can anything be saved. The dialogue in George scrolls upwards, as in a chatroom, and therefore does not appear exactly as a conversation might be expected to in an English language teaching situation. There is, however, a link to view the conversation so far. Jenny, Cybelle and the Ultra Hal Assistant show the most recent response only. Nothing prior to this can be accessed or saved. In terms of response times, George has the fastest reactions, with almost instantaneous replies. Dave's responses are generally quite acceptable. Cybelle, Jenny and Lucy can be somewhat slow at times, sometimes leaving the user to wait for 10 seconds or more before a response is generated. The Ultra Hal Assistant is naturally fast as it is installed as a standalone program. The conversation in both Lucy and George can be e-mailed, a useful feature. It is not possible to save or e-mail the conversation in any of the other chatbots, however. Generally speaking, where the interface in uncluttered (as with Lucy and Dave, for example) program operation is quite intuitive. George is the only program with a help feature on how to get the program to operate, or to get the best out of the program in terms of how it handles language and how it may respond. This is only in English, however, and for lower-level English language learners might not be easily understood. George has �reaction' and �emotion' buttons which supposedly increase the �emotional intelligence' of the conversation. In practice, however, these buttons seem to contribute little to the quality of the conversation. They are an attempt to begin to deal with register as a linguistic feature, although they are not managing very well as yet. George and Lucy have features whereby the chatbots can be �taught'. This obviously permits the chatbots' language databases to be enlarged. In terms of innovation, the Ultra Hal Assistant scores highly because it incorporates voice recognition as input, and for this reason alone it has been included in the current study. The program must, however, first be trained to a single user's speech �using either commercially-available software such as Dragon NaturallySpeaking (Nuance, 2006) or Microsoft's Speech Application Programming Interface Speech SDK 5.1 (http://www.microsoft.com). The quality of recognised speech is, however, not particularly accurate. Since it is voice recognition accuracy is generally lower with second-language speakers of English than with first-language speakers (Coniam, 1998), the Ultra Hal Assistant is some way off being usable as an ESL tool with second language learners of English. Consequently, while the program has been included in the software evaluation review in the current paper, its linguistic performance was not analysed in the previous paper. All the online chatbots reviewed are free with the exception of Dave, which costs US$9.99 as a one-off subscription. A paid version of George (US$30 per year) is available, which apparently permits the user to teach George, to adapt George to �your personality - your character� and to incorporate a version of that chatbot on one's own website (http://www.jabberwacky.com/yourbot). The basic cost of the Zabaware's Ultra Hal Assistant is US$29.99. A summary of the issues discussed above is now presented in Table 3 below. Table 3. Summary of the features of different programs. In summary, Lucy has the most attractive interface in that the screen is uncluttered and the avatar is large and has an attractive, friendly appearance. Lucy also responds in very acceptable spoken English, with good lip-synching. It is also possible to view and save (i.e., e-mail) conversations. One slight problem with using Lucy is that response time from a user's input to her answering can occasionally be slow. Nonetheless, it is free. From the perspective of a CALL piece of software, therefore, Lucy emerges as the program with most potential from an ESL learning perspective. Thus far we have examined chatbots' appearance, functionality and ability with language. I would now briefly like to consider issues from a pedagogical perspective, and discuss their possible use in the ESL classroom. Subsequent to their evaluations, as part of teaching practice, the student-teacher evaluators taught ESL lessons, where they encouraged their ESL students to interact with the chatbots they had been evaluating. The lessons were not open-ended, but generally had a language focus. I will now briefly report on the classroom activities of some of the trainee teachers in the current study, who, having participated in the evaluation of the chatbots, used them in their teaching for specific language activities. In one class, students had to use various wh- questions to get as much personal information from the chatbot as they could in order to write a description of the chatbot (a sample appeared in Figure 2). In another, the teaching point was the modal verb �should�. In this lesson, after first working out questions centring around �should� that they might ask, students had to try out their questions on the chatbot. Finally, they had to report back to the class the questions they had put to the chatbot and how it had answered them. I will report in more depth on one teacher who was teaching reported speech. This teacher asked the students to spend time talking to George and to find out things about him. Students had to first note the questions they put and the answers they received and then write these up as a standard language practice drill. Table 4 elaborates the work produced by one student in the class. I'm OK, thanks, just a bit bored. I asked her how she was that day. She told me she was OK, just a bit bored. I asked why she was bored. She told me she was at work. I asked where she worked. She told me she worked at home. I asked her where she lived. She told me she lived in Loughborough. I asked her that is she the computer. She told me she was a woman. Table 4. Work produced by one (less able) student. For homework (to be subsequently handed in to the teacher), students had to write up their �interview' in the form of a short article. One advantage was that different students' language levels could be taken account of. More able students were able to ask more complex questions, while less able students (as in Table 4 above, for example) asked somewhat simpler questions. All students were actively engaged in the task despite certain problems with George (see below) and despite the fact that that they were not interviewing real people. The majority also submitted some interesting articles as homework. The teacher polled students of this lesson with a short questionnaire in order to gauge their reactions to the chatbot and to chatting with it. Students' responses to the lesson were mixed: while some responded that they had enjoyed the lesson (as with the student whose work is shown in Table 4 above), others (the more able ones) were less positive because they could not always follow George's conversational threads, and (according to their responses) �wasted time on arguing� with the chatbot when he responded unpredictably. Most students also commented rather unenthusiastically on George's rather dull interface, with its lack of an avatar, and no spoken output. This paper has described a study of certain chatbots currently available over the Internet. The study has involved an evaluation of those chatbots in terms of their appearance and functionality as programs; their ability in terms of handling language and taking part in a conversation; and has provided a snapshot of their potential in the ESL classroom. Many of the chatbots have also incorporated spoken output. Lucy's speech is of quite high quality, as is Dave's. While still computer generated, it is approaching the qualities of human speech with good stress, rhythm and intonation patterns. George's speech output, via the program Shockwave, is not as good, sounding much more mechanical than that of Lucy and Dave . Screen design also merits mention. Lucy's and Dave's screens are meant for ESL learners and are uncluttered. George, and Cybelle especially, have buttons, links and adverts all over the screen. This is distracting as well as confusing for potential learners. For a program to be worthwhile as a second language tool, the learner needs easy access to their transcripts of their conversations, since these can then be used as follow-up in the classroom or as homework. Lucy provides this in a very accessible manner, as does George . In terms of the chatbot with the best ESL potential, the final decision would be a close call between George and Lucy. George, the winner of the 2005 Loebner prize, clearly has the best language capabilities. He is possibly more suited to advanced level learners, who are able to follow (or who are prepared to work at) the twists and turns of his conversations. George scores poorly, however, in terms of cluttered screen layout, no avatar, and poor audio quality of the spoken output. Lucy is not as linguistically gifted as George, but her screen is clear, she has an attractive appearance and good quality sound output. There is easy access to the ongoing conversation, which can be easily printed or saved. She also has some useful pedagogical features; she can be taught, and she can suggest corrections to certain ungrammatical utterances. Special mention must go to the Ultra Hal Assistant. This is a bold attempt at incorporating voice recognition into the chatbot engine. However, while it gives an indication of what we may hope for in five years' time, currently, it makes so many errors of recognition and incoherent follow-up that its potential for use with ESL learners is not really a possibility. In terms of exploring and investigating their ability to respond accurately and sensibly in English, it will have been noted that while chatbots have potential, they still have many limitations. Essentially, they cope and respond best when they are given simple one-clause questions or statements which embrace straightforward propositions and little in the way of cohesive links to what has gone before in the conversation. To restate a point from the previous paper, the current generation of chatbots are still unlikely to pass the Turing Test in the near future. Successful simulated conversation places large demands on the capabilities of natural language parsers/grammars and on speech systems, with the effectiveness of conversational exchanges relying on the ability of artificial intelligence to understand human language and to generate logically consistent and realistic responses. Nonetheless, technology is progressing at a substantial rate, as may be seen from programs such as the Ultra Hal Assistant. Continuing advances in speech understanding technologies, (Fenton-Kerr, 2002) for example, will eventually overcome some of the problems discussed in this paper. And while we still have a long way to go in terms of providing language learners with a robust �conversation practice machine' (Atwell, 1999) �with all the nuances that such a machine requires� we are getting closer. Note 2. IELTS (the International English language Testing System; http://www.ielts.org) measures the ability to communicate in English for people who intend to study or work where English is the language of communication. Originally the UK and Australia's tertiary-level English language test, it is now taken by over half a million test takers yearly. It rates test takers on a nine-point scale, with level six generally being the standard required by UK universities for entrance purposes. Chatterjee, A. and Meijer, P. (2005). DeMeCoT, The Delftse Methode conversation trainer. Association for Computers and the Humanities / Association for Literary and Linguistic Computing Conference, Victoria, Canada, June 15-18, 2005. Coniam, D. (1998) Voice recognition software accuracy with second language speakers of English. SYSTEM , Vol. 27, No. 1, 1-16. Coniam, D. (2004) Using language engineering programs to raise awareness of future CALL potential. Computer Assisted Language Learning, Vol. 17, No. 2, pp. 149-176. Halliday, M.A.K. (1994)An introduction to functional grammar (2nd ed.). London: Edward Arnold. Hardisty, D. & Windeatt, S. (1989) CALL. Oxford: Oxford University Press. Hubbard, P. (1992) �A methodological framework for CALL courseware development� in Pennington, Martha and Stevens, Vance (eds.) Computers in Applied Linguistics: An International Perspective. Clevedon: Multilingual Matters. Ladder Digital Education Corp. (2005) Lucy's World: Smallt@lk. Available at http://www.speak2me.net. Nuance. (2006) Dragon NaturallySpeaking 9. http://www.nuance.com/naturallyspeaking/. Parker, L. Leann. (2005) Language development technologies for young English learners. University of California, Office of the President. Available at http://www.ucop.edu/elltech/parkerpaper1-21-05.pdf. Salaberry, M. Rafael. (1996) A theoretical foundation for the development of pedagogical tasks in computer mediated communication. Calico Journal, Volume 14 Number 1, 5-34. Warschauer, M., & Healey, D. (1998) Computers and language learning: An overview. Language Teaching, 31: 57-71. Coniam, D. (forthcoming) Evaluating the language resources of chatbots for their potential in English as a Second Language learning. Foreign language learning at the pre-school level is a pressing reality in Europe's cross-cultural curricula. Along with competency demands, developed by European Union commissions and the various Boards of Education of individual member-states, revolutionary multimedia tools are being implemented in early age bands such as for 3-5 year olds. However, little research has been done thus far for this very young age group of language learners. Without a doubt, careful consideration is to be taken regarding both the psychological and physical capacities in this tender age bracket, far different from those of adolescents and adults. For this reason, the SHAIEX project developed by the GexCALL research group at the University of Extremadura in Spain, attempts to properly address this particular target group by providing innovative adaptation to adequately suit their needs in the foreign language learning and acquisition environment of new technologies. Pedagogical principles are respected in customizing a highly visual and simplistic adaptive design, placing an emphasis on oral/aural language learning skills, highlighting creative cognition for motivational purposes, and, supplying ample psycho-motor interaction for physical control in mastering dexterity with multimedia tools. Plenty of practice is provided in linguistic content as determined by legislative guidelines by means of a three tier system with presentation, interaction, evaluation and reinforcement functional activity blocks. It seems safe to claim that the proper design of multimedia tasks for pre-school children adapted to the youngster's level of knowledge, interests and interaction skills is a potential guarantee that success can be obtained. SHAIEX (Sistema Hipermedia Adaptativo para la enseñanza de idiomas en entorno Linex ) stands for Adaptive Hypermedia System for the Teaching of Languages at Early Ages built in Linux (figure 1). It is a long-term government funded project* being developed since 2004 at the University of Extremadura http://www.unex.es by the interdisciplinary research team GexCALL http://gexcall.unex.es (Research Group for Computer Assisted Language Learning). The creation of SHAIEX facilitates the design of multimedia linguistic material with the express purpose of adapting and customizing the teaching/learning processes to fit the personal traits of target learners, i.e. primary and pre-school-aged children. The role played by new technologies in the aforementioned processes is fully researched and effective methodological proposals are offered based on the data being collected. In this sense, practical on site observation and analysis of computerized language learning methods and strategies allows for the building of solid theory to back the virtual learning models which have been designed. Figure 1. Opening view of the SHAIEX program. L2 multimedia tasks for primary and pre-school children can pose a wide range of challenges for both the language teacher and computer specialist alike. The design of linguistic content and technological adaptation to young learners and their psychological and physical characteristics make the study of certain factors necessary, such as the educational context, linguistic constraints, cognitive abilities, conceptual and psychomotor restrictions, and so on. This type of questioning approach for the creation of multimedia tasks has led us to analyze learning factors, and devise proposals, in order to deal with the linguistic, conceptual and technological demands in the children's learning environment. Most software developers take for granted that all users are proficient enough to handle multimedia interfaces and that they fully understand the content, tasks and feedback relayed in text-based instructions. However, interfaces lacking audio-visual help can render them inappropriate for certain users requiring graphical hands-on know-how in an illustrative, sensory-enhanced format. Children of early ages are a clear example of these circumstances as they have not yet reached a sophisticated command of the reading and writing skills required to master multimedia tasks void of or sparse in audio-visual support. As new technologies make their way into all types of classrooms as an additional teaching tool for learning, sound pedagogical practice demands the creation of software be suited to the level of cognitive development, literacy and capacities of special users. SHAIEX proposes design principles adapted to meeting the linguistic and graphical criteria needed by very young learners to carry out multimedia tasks adroitly. Regarding linguistic content, we claim that multimedia tasks should adjust as the child progressively moves along and demonstrates skill in itineraries entailing lower and higher degrees of complexity in terms of language proficiency, topics, ethical values, emotions, and the social environment. The aforementioned objective is a matter that is far easier said than done. The effective incorporation of ICTs in the classroom, and the suitable use of educational software for early ages, is not exempt from some very important challenges. In this period, small children have not yet developed all the language and cognitive abilities that older learners have. These circumstances demand an almost exclusively visual interface from the system, and require, in addition, previous training in the use of computers and input devices, in particular, with the computer mouse and the keyboard. An unmonitored use of ICTs in the classroom could provoke a negative impact on children, causing possible rejection or frustration, and, therefore it is a subject that should be properly addressed. Observational perception of children's needs in the learning environment indicate that emphasis on the visual or graphical aspect is a top priority. Suitability in terms of graphical characterization, layout, setting, and interface function therefore become prime factors for increasing motivation and interest among young learners. As for graphic components, interfaces should be highly intuitive, aim for simplification by containing easy to understand instructions, provide user-friendly guidance to prompt children to accomplish tasks with the fewest possible number of steps , include visually meaningful icons recognizable to the child as pertaining to his/her environment , and other similar considerations of general attractiveness to stimulate interest for this particularly early stage of language development. Figure 2. Adaptive design of linguistic content. Enhancing motivation, commitment and creativity demands that the educational software be open enough to invite exploration. Challenges can be more easily met when stimulated by fantasy and piqued by curiosity. At this level, in which children do not yet have sophisticated reading and /or writing skills if any at all, the oral/aural presentation of instructions and content plays a leading role. Moreover, appropriate educational software for the early ages must have the capacity to adapt its content to the special characteristics, specific level and individualized progress of each child. For these reasons, all activities, the interface, software structure, vocabulary, and other ingredients are tailored to the age of the potential users of the product and presented with the hierarchical building of sequential activities for completion as a key element for calibrated involvement through computer support. Creating multimedia material for young learners means highlighting the importance of their degree of cognitive development. Grasping abstract concepts can be difficult since small children have not yet acquired most of the basic knowledge required for complex conceptualization and intricate information. They do on the other hand, understand visual icons and relate to recognizable items which can help them to extend knowledge and meaning. Nonetheless, just as visual aspects are basic in the adaptive design, and oral/aural forms basic to language development, so too is creativity fundamental in cognitive capacity. Associations to real life situations are exploited as children tend to imagine that all the objects present and possess the proprieties of their real-life counterparts. Although generally avoided, certain abstract concepts may be introduced as long as they are limited to those within the realm of children's cognitive abilities (e.g. the affective factor). Provisions are made for dexterity with the computer mouse and interaction with the computer itself. Small children are in the process of acquiring and perfecting their motor abilities and at first may encounter difficulties in controlling the input device chosen. They may have trouble selecting specific areas on the computer screen within the application. They may find holding down buttons on the mouse initially challenging, and need development in skills like pressing keys on the keyboard just to name a few mechanical movements assumed as givens with older learners or adults. The device selected for interaction with the system is the mouse, however, one-click is easier than dragging, or drag and drop, or double-click. Therefore, as children are learning to use the mouse, the operations require repetition and extended practice. In other words, we need to adapt the use of the mouse in the activities and games to the dexterity children are able to gradually handle. Furthermore, the ability to use the input device is fundamental as it means that the children can go on to tackling the cognitive tasks, whereas failure to handle the interaction device means frustration and cutting off the learning process at the root. The European Language Portfolio on pre-school education, regional and national legislation, and questionnaire data collected from pre-school classrooms lay the foundations for the way linguistic content is presented, i.e. mainly based on audio-visual information adapted to children's educational contexts. Three age levels in the curricula are targeted: 3 (level 1), 4 (level 2) and 5-year-olds (level 3). Within the levels, all tasks include four blocks of activities: presentation, interaction, evaluation and reinforcement, each respectively devoted to such functions as (1) presenting new vocabulary, phrases and sentences (2) consolidating concepts and linguistic content by means of interactive and adaptive activities; (3) assessing progress, and, (4) revising and extending knowledge from the previous sections. SHAIEX's design of appropriate multimedia tasks for pre-school children adapts to the youngster's level of knowledge and interaction skills by providing activities in three fundamental aspects, namely linguistic content, cognitive abilities, and interaction. Linguistic content varies because different itineraries and their complexity become available according to the child's progress. Furthermore, learners may choose to repeat, or go back at will, and the adaptive system allows for this type of flexibility. The vast majority of the input is aural, which in turn should solicit oral responses from the child or an action to be taken on the screen. Information is conveniently backed up with a visual or an illustrative framework. Limited textual content, in particular for level 3 (usually 5 - year - olds) is represented in captions. The educational levels themselves are merely an orientation since individualized pacing depends on the child's capacity for exact placement. In this sense, a three - year - old may advance to level 2 and a five - year - old may hold back in level 1, or vice versa. Figure 2 illustrates the increasing complexity of levels in Unit 1 Hello! Wherein level 1 the character introduces him /herself by name only, in level 2 it identifies the type of animal s/he is as well, and finally in level 3 informs of his/her national origin too. Figure 3. Adaptive features of level 1. Directly linked to linguistic content is cognitive ability which is mainly depicted as visual and auditory information although textual information at word level is feasible in restricted quantities. As a general rule, familiar content is thoroughly exploited and metaphorical content is mostly avoided. However, as has been exemplified with level 3, the abstract concept of country of origin has been purposely introduced. Very young learners in today's pre-school classrooms experience the concept of cultural diversity every day. The SHAIEX characters represent this multicultural reality which helps them build positive interpersonal relationships by converting this abstract concept into the familiarity of their micro world. Therefore, national origin, indeed an abstraction, is by no means understood from the adult perspective, but rather from the relevancy it holds for young children who have friends and classmates from other countries in school and comprehend this phenomenon from their own particular viewpoint. Last but not least, expertise is required with the interaction device in order to use the system. Dexterity with the computer mouse involves three carefully monitored levels of execution: a single click (level 1), click move click (level 2), and a double click or drag and drop (level 3). 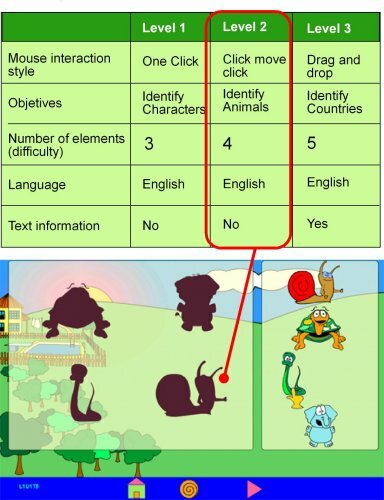 The adaptive activity in figure 3 pertains to level 1, in which the child (normally a 3-year-old) will practice making the puzzle by clicking on the animal figure once. The character will adhere to the mouse so that the child needs only to move it into the silhouette and watch it automatically fall into place. The objective is reduced to identification, fewer elements are presented, and no text form of language content appears. Level 2 (figure 4) steps up the pace by requiring a click, followed by a move into the silhouette, and finalizing with a click in order to obtain release. Not only is identification an objective, but so is recognition of the type of animal; also, the number of elements has increased, thus raising the difficulty by providing more options to choose from, while the absence of textual language remains a constant. Level 3 complicates the action by calling for drag and drop training movements. Furthermore, the country of origin is added to the identification and classification requirements, the difficulty of choice among the number of elements continues to go up, and for the first time, some text appears to accompany the illustrations. Figure 4. Adaptive features of level 2. Most assuredly computer-based foreign language learning for pre-school children is an extremely intricate process. The SHAIEX platform has been designed by keeping in mind the aforementioned principles and practices of tailoring CALL to very early learners. The system has been elaborated to suit young children's needs in order to comply with the present day educational legislation using new technologies. As implementation has hastily preceded research methods indicating exactly how the process is to take place with 3-5 year-olds, it seems that structured guidelines such as those expressed herein can facilitate and expedite the ways and means to obtaining the goal of introducing multimedia foreign language learning in pre-school settings. The theoretical underpinnings of user impact and the feedback they provide are presently underway with the in-depth evaluation of the SHAIEX computerized language learning program in private and public pre-schools in the region. Undoubtedly among other considerations that can be made, the following are considered essential by the project work completed thus far: 1) respecting restrictions on early cognitive capacities, 2) choosing and presenting metaphoric concepts with great care, 3) favoring visual and auditory components, 4) striving for simplicity, and, 5) providing entertaining tasks to encourage and master mouse dexterity. Identification of the aforementioned principles was made possible in previously probed pilot groups by GexCALL from 2005-2006. The preliminary results have supplied the data required for a larger scale application initiated in 2007 and to be continued throughout 2008. Further information on the SHAIEX project can be consulted in the bibliographical references provided, and any questions, ideas or comments contributing to knowledge on the subject are most certainly welcomed at http://gexcall.unex.es . Agudo, J. E., Sánchez, H., Rico, M. (2006) SHAIEx: Adaptive computer assisted English learning at early ages. In: Redondo Duque, M. A., Bravo Santos, C. and Ortega Cantero, M. (eds.) Diseño de la interacción persona-computador: Tendencias y desafíos. Ciudad Real, Spain: INTERACCION 2006, 347-350. Agudo, J. E., Sánchez, H. and Rico, M. (2006) Adaptive learning for very young learner s. Lecture Notes in Computer Science Vol 4018. Dublín: Springer - Berlin / Heidelberg, 393-397. Agudo, J E., Sanchez, H.and Holguín, J. M. (2006) English Learning at Preschool Using Adaptive Games. Proceedings of the 12th International CALL Research Conference How are we doing? CALL and Monitoring the Learner. Antwerp, Belgium: Universitet Antwerpen, 17-22. 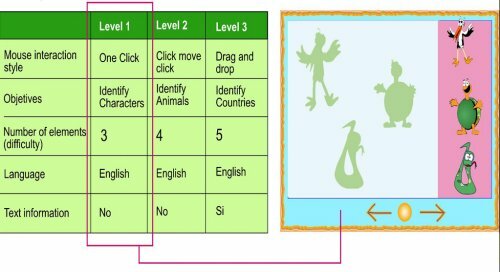 Agudo, J. E., Sanchez, H., Holguin J. M. and Tello, D. (2007) Adaptive Computer Games for Second Language Learning in Early Childhood . In: Singhal, M. (ed.) Proceedings of the Third International Online Conference on Foreign Language Teaching and Research . USA: The Reading Matrix Inc, 167-80. Agudo, J. E., Sanchez, H., Rico, M., Curado, A. and Dominguez, E. (2006) Adaptive hypermedia for foreign language development at early ages . International Transactions on Computer Science and Engineering. Seoul, Korea: Guest Publishing, 90-101. 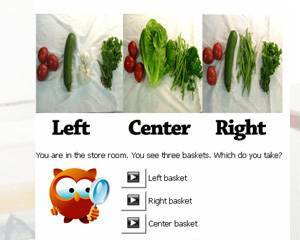 Agudo, J. E., Sanchez, H. and Sosa, E. (2005) Adaptive hypermedia systems for English learning at Pre-school. In: Mendez-Vilas, A., Gonzalez-Pereira, B., Mesa Gonzalez, J. and Mesa Gonzalez, J. A. (eds.) Recent Research Developments in Learning Technology . Badajoz, Spain: FORMATEX Research Center , 300-304. Agudo, J. E., Sánchez, H. and Sosa, E. (2006) Aprendizaje asistido por ordenador en Educación Infantil. In: Rico, M., Domínguez, E. and Curado, A. (eds.) Educación, Lenguas y Tecnologías. Cáceres, Spain: Servicio de Publicaciones de la Universidad de Extremadura, 13-23. Agudo, J. E., Sanchez, H., Cumbreño, A. B. and Rico, M. (2006) SHAIEX: A Web-based Architecture for Adaptive English Learning. In: Guerrero - Bote, V. P. (ed.) Current Research in Information Sciences and Technologies II Multidisciplinary Approaches to Global Information Systems. Mérida, Spain: Open Institute of Knowledge, 261-65. Cumbreño, A. B., Rico, M., Curado, A. and Dominguez, E., (2006) Developing Adaptive Systems at Early Stages of Children's Foreign Language Development. 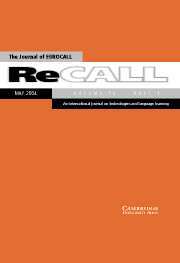 ReCALL International Journal 18 (1): 45-62. Curado A., Rico, M., Dominguez, E. and Cumbreño, A. B. 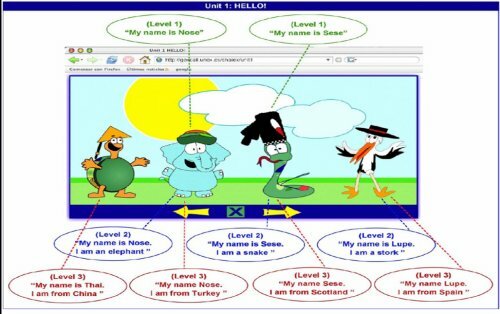 (2006) Teaching language, values, and personal autonomy to very young learners through hypermedia systems. In Proceedings of the 12th International CALL Research Conference How are we doing? CALL & Monitoring the Learner. Antwerp, Belgium: Universitet Antwerpen, 175-182. Curado, A., Rico, M. and Edwards, P. (forthcoming). Corpus-based Information and Adaptive Hypermedia Content for L2 Learning in Children . Castelló, Spain: Universidad Jaume I.
Domínguez, E. (2006) Diseño gráfico para entornos hypermedia con fines educativos en edades tempranas. 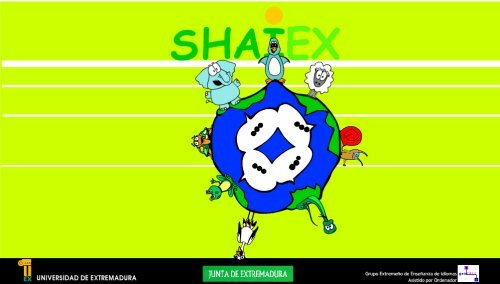 SHAIEX: un proyecto como ejemplo. In: Rico, M., Domínguez, E. and Curado, A. (eds. ), Educación Lenguas y Tecnologías . Cáceres, Spain: Servicio de Publicaciones de la Universidad de Extremadura, 44-58. Domínguez Gómez, E., Rico Garcia, M., and Cumbreño Espada, A. B. (2007) Relevancia del diseño gráfico en un SHA (Sistema Hipermedia Adaptativo) para el aprendizaje de idiomas en niños entre 3 y 6 años. Actas de Diseño 3 Universidad de Palermo . Buenos Aires, Argentina: Estela Pagani, 67-71. Hernández, E. (2006) Contenidos en Lengua Inglesa en Educación Infantil. In: Rico, M., Dominguez, E. and Curado, A. (eds. ), Educación Lenguas y Tecnologías. Cáceres, Spain: Servicio de Publicaciones de la Universidad de Extremadura, 119-126. Hernández, E. (2006) Trabajando con estadística. In: Rico, M., Domínguez, E. and Curado, A. (eds. ), Educación Lenguas y Tecnologías. Cáceres, Spain: Servicio de Publicaciones de la Universidad de Extremadura, 58-68. Pain, M. A. (2006) Reflexiones sobre la implantación del aprendizaje de inglés en la educación infantil en el ámbito de la Comunidad Autónoma Extremeña. In: Rico, M., Domínguez, E. and Curado, A. (eds. ), Educación Lenguas y Tecnologías . Cáceres, Spain: Servicio de Publicaciones de la Universidad de Extremadura, 158-165. Rico, M., Dominguez, E. and Cumbreño, A. B. (2005) Using ICTs at Early Ages for Language Teaching and Research. In: Mendez-Vilas, A., Gonzalez-Pereira, B., Mesa Gonzalez, J. and Mesa Gonzalez, J. A. (eds.) Recent Research Developments in Learning Technology. Badajoz, Spain: FORMATEX Research Center, 1144-1148. Rico García, M. and Cumbreño, A. B. (2006) Adaptación y aprendizaje temprano en la enseñanza de idiomas. In: Rico, M., Domínguez, E. and Curado, A. (eds.) Educación, Lenguas y Tecnologías / Education, Language and Technology. Cáceres, Spain: Servicio de Publicaciones de la Universidad de Extremadura, 24-32. Rico, M., Curado, A. and Edwards, P. (2007) Multi-Factorial Analysis in the Design of L2 Multimedia Tasks for Primary School Children. In: Singhal, M . (ed.) Proceedings of the Third International Online Conference on Foreign Language Teaching and Research. USA: The Reading Matrix Inc, 158-66. Rico, M., Curado, A., Cumbreño, A. B. and Domínguez, E., (2006) Hypermedia based Tasks for L2 Learning at Preschool and Primary Education. In: Guerrero - Bote, V. P. (ed.) Current Research in Information Sciences and Technologies II Multidisciplinary Approaches to Global Information Systems. Merida, Spain: Open Institute of Knowledge, 242 - 46. Sánchez, H., Agudo, J. E. and Sosa, E. (2006) Integración de las TICs en educación Infantil. In: Rico, M., Domínguez, E. and Curado, A. (eds.) Educación, Lenguas y Tecnologías. Cáceres, Spain: Servicio de Publicaciones de la Universidad de Extremadura, 82-97. *The SHAIEX project 2PR03A011 is financed by the Junta de Extremadura (Regional Government of Extremadura, Spain) under the auspices of the II Regional R&D Plan. The BE-CuLT website draws on a variety of different theories and approaches. The basic underlying principles are Computer Assisted Language Learning, Content and Language Integrated Learning, Autonomous Learning, and the promotion of intercultural competence. In the following, these principles are elaborated; as well as a discussion of other theoretical issues and their impact on the development of the website and organizational aspects of program application. The webtool was designed within the framework of an EU Leonardo program to enhance the mobility of young people in Europe in combination with professional vocational training. Its purpose is to help prepare young people to work in the hotel and gastronomy sector. The webtool can be used flexibly, as varied starting points and individual countries' and institutions' differences in their ability to integrate the tool were taken into account from the very beginning. There is no need of a trained language-teacher in order to work with the webtool; a cooking teacher, a staff manager, a social-worker, a senior colleague, etc. can take the role of a tutor. BE-CuLT can be used in tutored group learning situations as well as in independent work. BE-CuLT can be utilized not only to prepare students for foreign placements, but for a variety of other uses as well. For example, restaurants or hotels can use the webtool to train their employees to interact with guests from foreign countries. The program was developed in close connection with institutions which train, send and host trainees. A needs analysis, including questionnaires and discussions, was carried out during the development of the learning program. The opinions of representatives of both sending and hosting organizations from the countries involved were gathered, as well as reports by young people who went abroad and used parts of the website. The target group � young people in professional vocational training � often has limited personal and social experience. Therefore, there is a need to build up competencies which can enable them to participate successfully in mobilization programs. Due to the young people's lack of experience outside their social circle, often in combination with educational deficits, having already experienced failure in the regular systems, and family (or personal) problems, they often lack adequate social skills. Transferred to a workplace abroad, they often need language skills and culture integrated learning on the most basic level: greeting, answering questions, finding places, etc. particularly when the use of a foreign language is involved. BE-CuLT is designed to bridge these cultural gaps. One problem pointed out by teachers, trainers and employers is that the young people often have very low self esteem and lack the social skills necessary to interact at the workplace. Another point mentioned was some trainees' lack of motivation and staying power. From the trainees' point of view, this was partly confirmed. When the students who had been abroad were asked about the problems they encountered during their stay, a considerable number of them answered that they felt insecure, homesick, or missed their girl- or boyfriend. These difficulties show that it is important to provide young people with means of communication and to give them support during their stay abroad. The needs analysis has shown that the amount of hours needed for the program itself as well as for the qualification of staff carrying out the preparation is quite diverse. This makes it difficult to set up minimum standards. In most cases, a preparation time of about 20 hours is necessary. As one aim of BE-CuLT is that young people be able to prepare themselves without a tutor at their side, the trainees should be given enough time to work with the website on their own and use the tool. Trainers named the internet as the second most-used medium after books when preparing for a work placement abroad. This is a good precondition for the tool. The interviews with students also showed that they appreciate having a webtool to support them during their stay abroad. The trainees were open-minded towards an internet-tool like BE-CuLT. Preparation time also depends heavily on the level of language learning proficiency, the length of the stay abroad and differences or similarities between the mother tongue and the target language. Both students and teachers found two weeks to be the absolute minimum preparation time. BE-CuLT can be a good learning tool to support the trainees' independent learning process before and during their stay abroad. As to the equipment needed, access to a PC and to the internet is a minimum standard that all agreed can be fulfilled by every country. It is important to remember however, that the use of the BeCult Website should be seen as one method of preparation, and may be used together with other lingual and cultural trainings. The teachers and tutors should also be aware of the fact that the highest effect on the young learner concerning the lingual and intercultural competences is to be found in the placement situation itself and that the tool is designed to be an adequate tool preparing and supporting the stay abroad. Computer-assisted language learning is an approach to language teaching and learning where the use of a computer as an aid to the presentation, reinforcement and assessment of material to be learned, normally consisting of an interactive element. For professions relating to restaurant service, kitchen, and hotel reception, Be-CuLT presents trainees with typical situations represented in video clips, with young people playing the roles. There are also exercises and games in which the target language must be used. By these means, young people can become acquainted with the language. By watching videos, doing exercises and gaming, they learn dialogues related to their profession and can get an impression of the working culture of the host country. The term Content and Language Integrated Learning is used to describe a situation in which a subject (here cooking, serving, and reception in the hotel and catering sectors) is taught in a foreign language (for example Dutch). CLIL is now widely-used to teach languages. The BE-CuLT website provides an opportunity to also learn a language while learning about concrete working situations and getting general information on other countries and their cultures. The professional area is divided into three sections: hotel reception, kitchen and restaurant service. Each of these sections contains five or six different situations that BE-CuLT participants can use to prepare themselves before leaving for abroad. These situations were chosen during an expert workshop in Berlin and reflect the different working cultures in each of the participating countries. Within these sections, trainees can become acquainted with professional terminology through the use of Content and Language Integrated Learning. Alongside video clips with subtitles, various exercises and games are used to teach technical and professional terms. Videos and games are utilized for Content and Language Integrated Learning based on the assumption that they will help motivate trainees to learn the language of the host country. The program is aimed specifically at teaching professional vocabulary and idioms in the above-named sectors. This is reflected not only by an emphasis on terminology, but on the vocabulary used most in each area, for example nouns may be predominately foods or verbs may have to do with eating. The teachers and trainers interviewed deemed the trainees' foreign language competencies to be of utmost importance. One third indicated that language competence should be the main factor in the decision whether a placement abroad should take place or not. The companies interviewed also rated linguistic preparation as necessary for a successful placement. The trainees should be trained in listening and understanding the spoken language of the host country and should have some knowledge of professional terminology and idioms. From the point of view of the trainees, almost all indicated that linguistic preparation in advance is �very important� or �important�. Most of the trainees interviewed who had already been abroad indicated that they encountered language-related problems during their stay abroad. They had difficulties understanding both technical terms and the instructions of their colleagues as well as communicating in general. Although knowing the language was rated high, the primary target group is not as interested in grammar as in using the language; nor do A1/A2 levels of language competence necessitate extensive grammatical expertise of the language studied. Therefore, teaching should concentrate on the themes presented in the material, rather than stick to explaining grammatical structure in a traditional fashion. The Common European Framework of Reference for Languages (CEF) is an internationally approved tool for measuring language competence. With the introduction of the CEF, a unified system for describing foreign language ability was created. Similar to other language learning materials, BE-CuLT is structured to reflect the CEF levels of competence. The so-called �'can do' descriptions� of these levels concentrate not on faults and shortcomings, but rather look at development and growth of competencies. Since BE-CuLT is aimed at introducing languages to absolute beginners and learners with basic knowledge, levels A1 and A2 are of particular significance. However, in order to cope with the needs of realistic settings meant to mirror the workplace abroad, some fancy tightrope walking is necessary. On the one hand, the program's dialogues must be formulated to realistically reflect that which students can expect to hear in the unfamiliar training situation abroad. On the other hand, the dialogues must be easy enough for young trainees to understand and follow. Otherwise, chances increase that learners may become unmotivated and frustrated. Therefore, some dialogues may deviate from level A1 or A2. Factors such as the similarity between mother tongue and target language must also be considered and may result in different levels of difficulty, particularly for comprehension tasks. A 1:1 translation into every language is not aimed for; the differences between e.g. French and Finnish, or the similarities between e.g. Dutch and German make it undesirable to remain on one (e.g. A1) level when translating the dialogues. "Autonomy is essentially a matter of the learner's psychological relation to the process and content of learning" (David Little). Learner autonomy as understood by BE-CuLT is encouraged not only in the individual and untutored use of the program, but also in tutored language groups. In groups, it is also possible to select a variety of exercises, allow different learning tempos and support autonomy in the learning process. In experiential learning, the role of the trainer shifts from the traditional teacher to a tutor; a co-explorer and facilitator of learning. The importance of appropriate feedback to a successful learning experience is also taken into account; e-learning offers a wide variety of methods of giving feedback. As has been mentioned above, BE-CuLT also focuses on different cultural aspects in order to explain cultural and/or social differences within the partner countries. Beside social, professional and language skills, some knowledge of the host country's culture, particularly the working culture, is important. Culture is understood in this project in a broader sense. It is defined as an orientation system that influences thinking, feeling, recognizing and acting (see Hofstede 2005, Trompenaar 1997 and Kotthoff/Spencer-Oatey 2007). To have knowledge of this orientation system and its symbols (e.g. language, values, rules, rituals, taboos or lifestyles) means to feel safe and to feel a sense of belonging to a group. Before going abroad and working in another cultural context, the trainees should have some knowledge about the host country. They should for example know about some 'dos and don'ts', about some manners and rituals. BE-CuLT tries to give some basic information, and strives, despite the small amount of information imparted, to avoid enforcing existing stereotypes and prejudices. 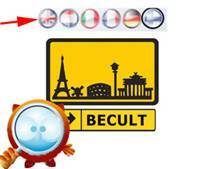 BE-CuLT also contains a cultural area which provides general information about the countries. The website includes videos which point out cultural and social singularities in each country, in order to make differences as well as the relativity of perspective more understandable for each student. In the cultural area, students can find helpful information about the host country and its culture. This area explores different cultural dimensions to explain cultural or social differences within the partner countries. The dimensions the project deemed important are: different concepts / understandings of time, communication styles, power structures, individualism / collectivism. The needs analysis revealed the need for cultural preparation. Trainers from different hotels or restaurants appreciate it when the trainees know something about the differences in the working culture; e.g. the working hours and the different understanding of time, different standards of hygiene, security rules or different levels of hierarchy. Therefore, BE-CuLT also provides this information within the professional area by means of videos and games. Professional competence is knowledge about other cultures (in the broadest sense) (see also 'The Development of National Educational Standards. An Expertise'). By including these cultural dimensions, students are better able to understand their host country. In computer assisted learning, learning and communication can be combined. BE-CuLT includes a zone for communication where the trainees have the possibility of communicating with their tutors, families or friends by chat or written messages in case of problems or homesickness. Another aim is to build contact between trainees of different countries so that they may exchange experiences and other information of interest. This area will also provide a download and upload function where e.g. teachers and trainers can upload materials for their students so that they have less difficulty catching up after returning. This helps to train the trainees' reflective (e.g. reading and understanding) and productive (e.g. writing) language competencies. By using the communication platform and staying in contact with trainees from other countries, they will read and write and automatically train the competencies described above. Last but not least, students can find useful links on the website. There are several links for further information on the host countries and cultures. One link will lead to the predecessor project of BE-CuLT: Easy2 (www.easy2.org), a learning tool to study English as a foreign language. In contrast to BE-CuLT, Easy2 is not specialized in a certain branch and is designed to train general language skills. Additionally, there will be links leading to different homepages from each country, to the EU and to other homepages. Federal Minestry for Education and Research, Germany (2004) The Development of National Educational Standards. An Expertise. Hofstede, Geert (2005) (with Gert Jan Hofstede): Cultures and Organizations: Software of the Mind. Revised and expanded 2nd Edition. New York: McGraw-Hill. Jung, Udo O. H. (2003) An International bibliography on computer-assisted language learning: fifth instalment. In: Systems, 30, 2003, S.349-398. Kotthoff, Helga and Helen Spencer-Oatey (2007) Handbooks of Applied Linguistics (HAL) Vol.7. Krashen, Stephen D. (1988) Second Language Acquisition and Second Language Learning, New York:Prentice Hall. Little, David (1999)"Autonomy in second language learning: some theoretical perspectives and their practical implications". In: Edelhoff, C./Weskamp, R. (eds. ): Autonomes Fremdsprachenlernen. Ismaning, 22-35. Little, David and Radka Perclová (2001) "European Language Portfolio: Guide for Teachers and Teacher Trainers". Strasbourg: Council of Europe. Trompenaars, F. and Hampden-Turner, C. (1997) Riding the Waves of Culture: Understanding Cultural Diversity in Business (Second Edition) London: Nicholas Brealey. Vollmer, Helmut J. (1999) "Priorities for Developing Content and Language Integrated Learning (CLIL) in Europe after 2000: From Bilingualism to Multilingualism". In Marsh, D. & Marsland, B. (Hrsg. ), CLIL Initiatives for the Millenium. Report on the CELINK Think Tank, Jyväskylä. University of Jyväskylä, 118-121. The Becult website is a web-based tool for the cultural, linguistic and professional support of trainees in the hotel and catering sector leaving for a work experience abroad. The tool includes a video based language program, exercises and games, cultural information, communicational tools as well as other things. It is designed for special professional contexts �hotel reception, kitchen and restaurant service. It prepares young people in professional vocational training for a work experience abroad and provides linguistic and cultural support. 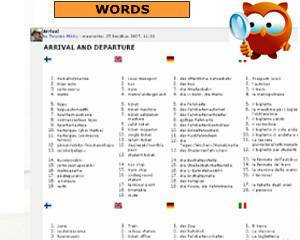 Finland, France, Germany, Italy and The Netherlands are represented on the website with their languages and cultures. The learning program is designed as a preparation and a guidance for a job-related stay abroad and as a help for continued learning and as a communication tool after the placement. It provides an insight into general cultural aspects as well as gastronomy and work-related particularities and allows the learner to become familiar with the language in the professional context by the use of appealing video clips, games and exercises, thus strengthening the learners´ motivation. In contrast to common foreign language training programs, this is not an introduction into grammar and language structure. Instead, the program was particularly designed to provide a possibility to become acquainted with the sound of the language, with common vocabulary and phrases to develop strategies to understand, and to get information about culture and professional contexts in the target country. This means that BeCult should be used in combination with other language learning methods. This project was funded by the European Commission within the Leonardo da Vinci program. The project duration was 1 year, from October 2005 to September 2007. The following information is taken from the project website and addresses the learner him or herself. 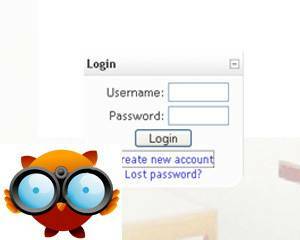 Learners require a user account to log into the system. The full features of the BeCult website are only available to registered users. After logging in, the learners starts by entering the multimedia learning platform. They then select the language they wish to learn by clicking on one of the flags. A new language can be selected at anytime. 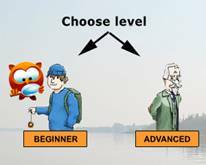 After choosing a language learners can select between two difficulty levels according to their experiences and aims: Beginner or Advanced. There are three professional language learning areas on the Becult website. These areas allow learners to experience typical working situations in different cultural settings: �The hotel area� contains learning materials about typical situations at a hotel reception. 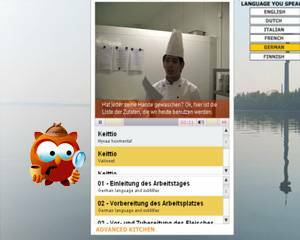 �The kitchen area� contains learning materials about typical situations in a restaurant kitchen. �The service area� contains learning materials about typical situations in an a-la-carte restaurant. In the �cultural area� learners can additionally watch videos showing features of the culture they are soon to learn about. 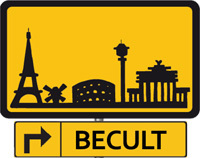 The Becult website includes a number of videos showing typical working situations in different languages. If the learner wishes to compare the videos with their own language they can select the same video in their language from a list. All the videos have subtitles, making them easier to follow. In addition, the whole dialogue can also be accessed as a text in the �Video scripts� section while watching the video. Learners may at all timesswitch h to the glossary in order to translate a selected word into any of the languages. In the Videoscript section, learners can access the scripts for the videos in all six languages. The scripts contain all the spoken dialogues in text format. It is possible to simultaneously read them while watching the videos or print them for later use. The English script was used as a blueprint for all the other languages. In the Exercises area learners can train and test their skills since the different exercises are related to the videos in the selected language and professional area, for example, French Cuisine. There are different types of exercises such as �gap-fill� or �matching�, etc. Because the the exercises on the BeCult website are bundled into SCORM-packages the results are saved, making it possible for the learner or the tutor to monitor the student's learning progress. After working with a given exercise the degree of completion will be shown on the screen. All the exercises were created using the �Hot Potatoes� software. Playing a game means action. Learners can learn and test their skills, trying to act in an appropriate way in a given situation in the selected language. In this section learners need to make choices. By making the right choices, learners move forward in the game and become acquainted with specific language and culture at the same time. The games are related in content to the learning videos. They were designed using the Half-Baked software called �Quandaries�. The website also inludes a link to the official European Language Portfolio website of the Council of Europe. The language portfolio is a document with which learners can monitor and reflect on their language learning and cultural experiences. The portfolio contains a language passport, a language biography and a language dossier. Its aims and functions are to motivate learners, as well as to provide a record of their linguistic and cultural skills. The link entitled Words gives access to the list of the most useful expressions and typically used phrases under a given topic. They are displayed side by side in several languages allowing learners to compare these and find similarities in different languages. Additionally, there is a Search box which allows the learner to find a given translation instantly. This function is particularly useful when watching the videos and/or reading the scripts, completing exercises or playing the learning games. There are two possibilities to communicate directly with a tutor or fellow learners before, during and after a placement abroad. 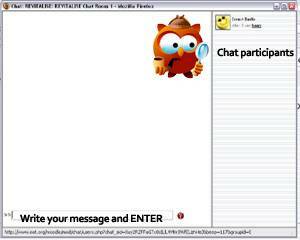 Learners can either use the chat function or write an e-mail message. These funtions encourage learner interaction and stimulate a sense of non-isolation by becoming aware that there are other learners pusuing the same goals. Learners can store the video sequences in Mp4-format onto an ipod and/or multimedia mobile phone. At the 2007 EUROCALL conference in Coleraine, the SIG for Natural Language Processing organized a symposium which was embedded in the regular paper sessions, in contrast to the pre-conference workshops the SIG had organized at earlier conferences. The symposium included a total of three papers. Detmar Meurers, in a paper with Luiz A. Amaral, argued in favour of a more flexible use of various NLP components in a complex learning environment. Whereas the typical pipeline architecture results in heavy loads for the computational system, a demand-driven use of NLP is flexible and allows for more task-specific processing. Gearóid Ó Néill then demonstrated how patterns found in a text corpus can reveal properties of a language. Regular inflection and, for Irish, aspects of initial mutation can be dealt with in this way. The resulting database can then be used for CALL exercises, generated from the corpus examples. The paper by Monica Ward considered the options when adapting a grammar and spell checker for young learners of Irish. As adapting an existing checker is considerably simpler than starting from scratch, adaptation to an audience with very little explicit knowledge of grammar terminology is more efficient, but requires some revision of feedback concepts. The symposium format worked well for this number of presentations and attracted a good audience. During the conference, the SIG also held its annual general meeting, discussing possible activities for the next year and holding elections. After serving as chair and secretary since the founding of the SIG at the Eurocall conference in Dundee in 2000, Mat Schulze and Trude Heift decided to step down as co-chairs, but have promised to remain active in the SIG. Aliy Fowler, also a founding member, has volunteered to continue to maintain the SIG website: http://siglp.eurocall-languages.org/. Aliy has also recently updated the SIG's logo, seen above. The SIG would like to express its sincere thanks to all of them for their invaluable contribution. The SIG members present nominated and elected Hans Paulussen and Cornelia Tschichold onto the board to alternate as chair and secretary. Hans Paulussen is affiliated as senior researcher at the "ALT Research Center on CALL" (http://www.kuleuven-kortrijk.be/alt), at the University of Leuven, Campus Kortrijk (B). He is involved in a number of CALL projects mainly based on the authoring system IDIOMATIC, and projects involving parallel corpora for Dutch. He is also a member of the EuroCALL corpusCALL SIG and he maintains the Belgian Eurocall website. Cornelia Tschichold works in the department of Applied Linguistics at Swansea University (UK) where she teaches an MA-level module on CALL. Her research focuses on computational phraseology, grammar checking for non-native writers and vocabulary acquisition through CALL mainly for English as a foreign language. The discussion during the meeting then centred around making the SIG more visible to the CALL community, with pre-conference workshops offering a good focus point. The SIG on Language Processing had organized such workshops at several Eurocall conferences: 2000 in Dundee, 2001 in Nijmegen , 2002 in Jyväskulä, and 2004 in Vienna . Hans Paulussen expressed an interest in organizing a workshop again at next year's Eurocall conference in Székesfehérvár (Hungary). In order to make the workshop more accessible to non-specialists, a two-part format with a general introductory half-day session, perhaps with a practical element, and a more research-oriented second part for state-of-the-art contributions was discussed. The possibility of a workshop or some other contribution at next year's WorldCALL conference in Japan was also considered. Decisions on both of these potential submissions will be taken at the appropriate time. Finally, activities within the NLP community but outside Eurocall were mentioned. Some of these take place within the framework of CALICO in North America . The collaboration with the sister organization CALICO can be said to be excellent, thanks to a number of personal and institutional links. Generally it was noted that there is considerable activity in the field of NLP in CALL over the coming months, with members of the SIG active in a number of conferences, i.e. a workshop on NLP for Educational Resources (ixa.si.ehu.es/NLP_ER2007) at the RANLP-2007 conference, in September 2007.
a workshop at the second Interfaces of Intelligent Computer-Assisted Language Learning conference (purl.org/i-call) at the University of Waterloo, 7-8 December 2007.
an ICALL panel at the AILA conference (www.aila2008.org) in Essen (Germany), 24-29 August 2008, also organized by members of the SIG-NLP. The main challenge for researchers working in the field of NLP in CALL is that of combining the most suitable approaches from computational linguistics and from the field of language learning into truly intelligent CALL, a target which is likely to remain interesting for some time to come. This is a review of the one day symposium held at Oxford e-Research Centre in the University of Oxford on 20th September 2007. The aim of this symposium was to bring researchers in linguistics and applied linguistics together and to discuss the potential for new forms of e-Research in linguistics and related areas in the UK. The symposium was organised by the Digital Record node of the National Centre for e-Social Science (NCeSS), the Oxford e-Research Centre (OERC), the Oxford Text Archive (OTA), the School of English Studies at the University of Nottingham, and the Arts and Humanities Data Service (AHDS), and took the form of five parallel presentations and two position papers, followed by a panel discussion. In this report, we reviewed the symposium based on what we have experienced from the Korean researchers' point of views. At least there is a common aim among e-Science, e-Social Science, and e-Research: to create dynamic virtual organisations where researchers can collaborate beyond disciplinary, institutional, and national boundaries. The emerging e-Science agenda across the Sciences and the Humanities, Information and Communication Technologies (ICTs) has radically transformed the way research communities across the world function. High-performance computers with optical high speed communications have significantly helped to improve the capacity of researchers to share their digital data resources and now they are able to communicate with each other freely. e-Research, which is a broader field than e-Science, has enabled researchers in fields as diverse as medicine, chemistry, education and linguistics to achieve world class research outcomes and to disseminate knowledge gained from research through the use of advanced ICTs. Consequently, the e-Research agenda is also set to transform how researchers do their work, how they collaborate, share data, report their findings, and what infrastructure they require to maximize potential to increase the efficiency and effectiveness of research endeavours regardless of discipline. After a brief welcome and introductory remark by Svenja Adolphs (University of Nottingham) and Martin Wynne (University of Oxford) the morning session entitled �What is e-Research?� was opened by Ann Trefethen. Her talk started with the e-Science definition by John Taylor at the inception of the UK e-Science Programme, and subsequently extended into a consideration of e-Research. During her presentation, she emphasised that e-Research could facilitate scholarly collaboration by providing access to shared data and document repositories, tools, and services. In addition she explored how e-Research could create and sustain research collaboration successfully. It used to be just a dream to tackle problems which we otherwise could not address due to the geographical constraints and time limits. She stressed, however, that many practical issues remain to be solved before carrying out e-Research projects. In particular, participants raised some issues, such as responsibility of the research outcomes from e-Research projects, decisions on roles of the projects, etc. Peter Halfpenny talked about �What is e-Social Science?� touching on many important issues, for example, the role of e-Science within social science, the impact of e-Research in the area of linguistics and applied linguistics, identification of key substantive research challenges, and the nature of interdisciplinary collaboration between computer scientists and linguists. He showed how computer scientists and social scientists could collaborate sharing information and accessing on-line digital resources by using Grid tools. He also explained how cutting-edge technologies like videoconferencing and high-definition audiovisual content could improve collaboration between researchers. In the virtual environment, Grid technologies could save time through the �Single Sign On' function which links data resources seamlessly. However, participants agreed that there were still unanswered questions in the area of e-Social science, for example: Who is going to take responsibilities for the quality of on-line resources? How can e-researchers sort out the huge amount of accessed data? etc. As one of the coordinators of the CLARIN (Common Language Resources and Technology Infrastructure) initiative, Martin Wynne introduced a pan-European grid for language resources. Since Europe is such a multilingual and multicultural society, there is a need to create a pan European infrastructure to boost humanities research at institutional level. CLARIN was established to fulfil those requirements. With the awareness of the necessity to address the challenges of an increasing interest in electronic and multimedia communication, the CLARIN project (http://www.mpi.nl/clarin/) has carried out a large-scale pan-European collaborative effort to create, coordinate and make language resources and technology available and, more importantly, useable. While listening to CLARIN which seems an efficient umbrella organization for the unification at the European level, several questions came up. For example, if we want to preserve our own cultural identity as well as make our young generations ready for global competition, improving their multilingual and multicultural awareness as in Europe, how can this task be implemented in the field of education? The two talks in the afternoon session were on multimodal corpora, an area where there is still a lot of work to be done. Ernst Thoutenhoofd presented a connection between technology and innovation in social science and humanities. It was very interesting to see how one of his fellow researchers defined the term �Innovation' and attempted to measure it. He argued that while corpora were a commonplace feature of mainstream linguistics in both language education and in linguistics research, there existed little effort to develop a corpus for sign language. With the introduction of the Virtual Knowledge Studio (VKS) programme, he argued that e-Research could be an excellent contact zone. Through the VKS, where there is a meeting of different research styles and cultures, e-Research could provide excellent opportunities for studying interaction between new language technologies and social science. His sign language corpora with multidisciplinary collaboration drew participants' attention, since this seemed to be a bridge among new technologies, social science, and humanities. Svenja Adolphs, Dawn Kignt and Dave Evans (University of Nottingham) made a joint presentation. They started with a claim that while current corpora allowed people to explore multimillion word databases, they failed to represent language and communication beyond the text. They explored how they could utilise new textualities in order to develop the scope of what a corpus could reveal and provide the tools for exploring discourse in specific contexts of communication. The specific linguistic focus in their project was the exploration of the roles and nature of gesture-in-talk. It seemed that the Nottingham team focused on codifying and analysing backchannels. To manage the scale of the research challenge they explored a particular sub-set of gesture (i.e. hand movements). Using video data recorded from conversational exchanges that were streamed with the verbal data, they were trying to develop multimodal corpora. However, as they stressed, we think that cultural issues have to considered, because people from different countries will use different gestures and they may be misinterpreted. The panel discussion was the most interesting and exciting session for us. Lou Burnard (Assistant Director of Oxford University Computing Services), Ron Carter (University of Nottingham), Peter Halfpenny (National Centre for e-Social Science), Paul Rayson (University of Lancaster), Ernst Thoutenhoofd (Royal Netherlands Academy of Art and Sciences) and Martin Wynne (Oxford e-Research Centre) took the stage and shared their ideas and experiences with the audience. Their comments made us think about the practicability of e-Research in the area of linguistics and applied linguistics, what should be done to create an appropriate infrastructure in the virtual environment, and how interdisciplinary collaboration could be established through e-Research. Although Edinburgh offered a one-year postgraduate programme in e-Science, one of the most important issues they considered was how to engage students (preferably A-level students) in the field of e-Research and the Grid. As far as we know there is no significant e-Research project in South Korea, and thus the symposium was a great opportunity for us to see the innovative endeavours of the UK and Europe in order to establish multidisciplinary collaboration through e-Research at the national and international levels. As emphasized in the event, frontier research in many fields will increasingly require the collaboration of globally distributed groups of researchers needing access to distributed computing and data resources. Furthermore, powerful software services will be widely deployed on top of the academic research networks to form the necessary �e-Research' to provide a collaborative research environment for the global academic community. In practice, however, there is a need to discuss how such innovative initiatives for e-infrastructure development in the cyberworld can be linked with language educators in the real world. At least, it is still questionable for us to what extent e-Research can be a practical guide for novice teacher-researchers to enhance their research programs. Although the one-day symposium left practical issues to be explored further, it was a valuable experience to broaden our horizons. For information on events, please refer to http://www.eurocall-languages.org/resources/calendar.html, which is regularly updated.